We have just returned from a really interesting weekend accompanying the team of three girls that we coached to participate in the Regional English Speaking Contest in Fuzhou. 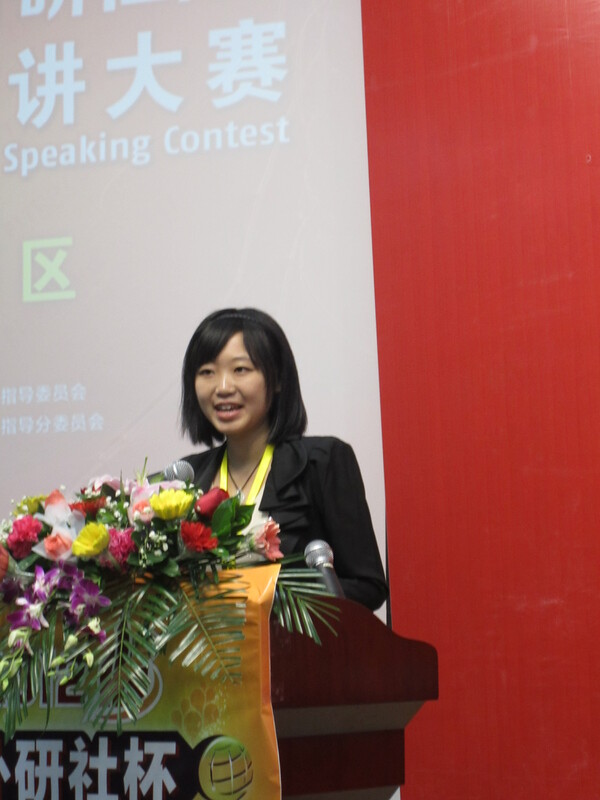 Altogether 75 candidates from different Universities in the province competed to go to the National Contest in Beijing. Our team consisted of Mavis,Witty and Shirley three lovely girls who have somehow become our “Xiamen Daughters” or possibly the 3 Musketeers. WE coached them on pronunciation, presentation,body language and suchlike over the course of the last 6 weeks and became very close. They frequently came over to work at our house and were regaled with tea and biscuits. Anyway the culmination of this process was the contest. For this we had to take a fast train for 2 hours to neighbouring Fuzhou where we were met by a volunteer from the Fuzhou College of Foreign Languages and Trade,this year’s venue for the Contest. 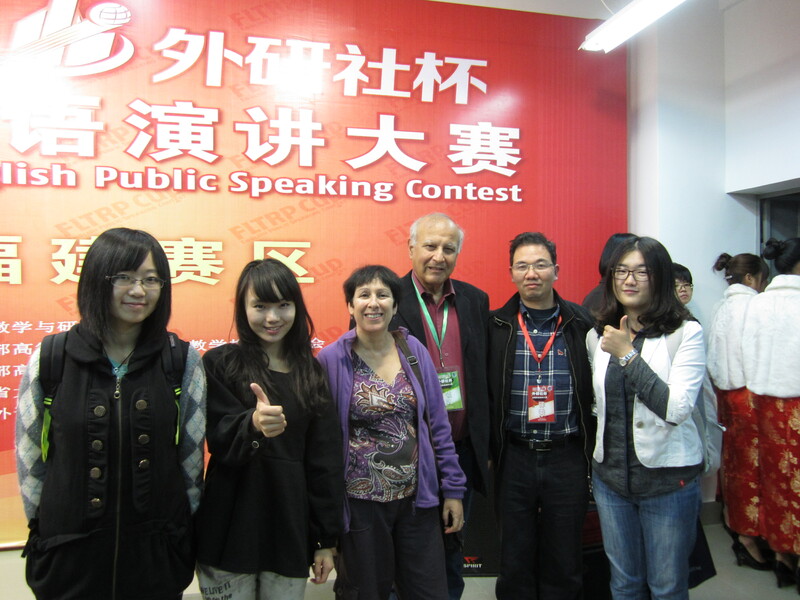 The organization of this contest was terrible even for China, but despite all the hitches we had a great time. This was partly because of the girls, but also because of the people we met.Out of all the hundreds of people attending,the only non Chinese were me,Danny, a coach for the Xiamen University team called Michael Oviedo (A Jewish guy from California) and Michael Garnett, a judge from Hatfield,(more of him later) and another lady judge whom we didn’t talk to.The girls were really nervous but did a great job. We got 6th place out of 74 and they performed really well.On arrival at the venue there was a draw to determine the contestants’ running order. WE got 1,23 and 37 which meant first contestant and then one in the middle and one almost last,as there were two separate rooms of speakers. The girls had to give a 3 minute prepared speech and then an impromptu unprepared speech followed by questions. Then we were taken by bus to the hotel (not so great but ok) and then dinner. Chaos was the main theme of the checkin at the hotel and then the subsequent running of the contest. What was really enjoyable was meeting all the young people participating and seeing their seriousness and fervour in preparing for their speeches. Some were really excellent too,although a few were weak. During the long afternoon in which the girls got all dolled up in their best and put on makeup and practised, we were suddenly approached by a Chinese lady who addressed us in fluent Hebrew! She turned out to be the wife of Michael Garnett,and had spent 10 years living in Israel,on Kibbutz Hazorea and then in Haifa. She embraced us like long lost family and said that now she and Michael live in Fuzhou and teach at Fujian College! Talk about a small world!. We of course exchanged phone numbers and emails and will stay in touch. At one point Shirley was in the lead,but at the end of the day the 3 winning contestants were from Xiamen University and Fujian University. 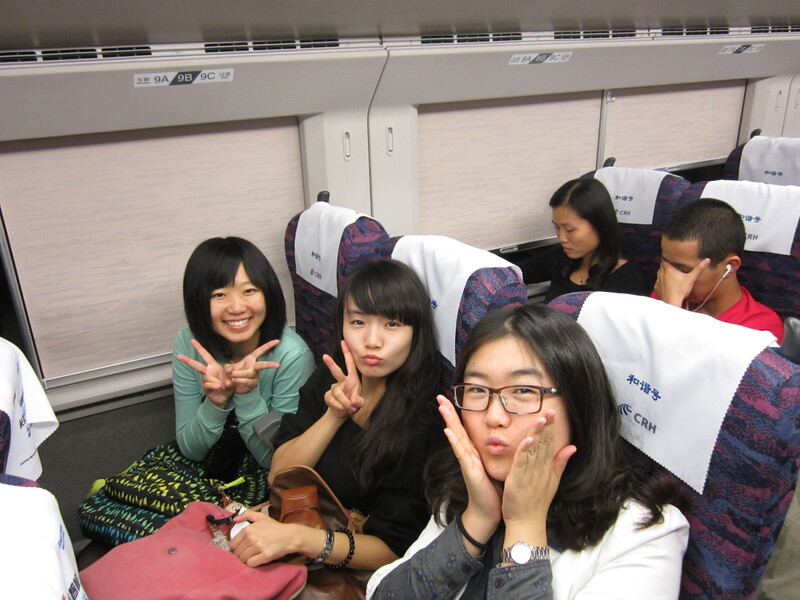 The contest finished at 6pm when we were returned by bus to the Fuznou train station,together with Kevin the Chinese teacher from our school who had been a judge in one of the rooms. On arrival back in Xiamen,Kevin ran us home in his car which he had parked at the station,and thanked us for all of our hard work. Today is Sunday,so we have a well earned day of rest!. using the Net in the classroom, innovating all kinds of web projects, international collaborative things etc.I knew it would happen ,but now it has ,I am nevertheless a little downcast. All my lofty intentions gone to waste in the miasma of everyday nothingness. Just read a really interesting discussion on linkedin group,Edubloggers,where the question was posed “who do we blog for?” and even “What is an Edublogger?” so I ask also “Am I an Edublogger because I talk about education? and who am I actually writing for ? Anyway I am sure that if logistically it were simpler to take the kids into the computer room I would do it,but they just make innovation so hard that nobody has the strength to do it,especially after teaching 7 hours straight of rowdy 11th graders.It’s as much as I can do to get home in one piece! Okay so here’s the thing. You walk into the classroom.It’s sweltering 35 degrees and the fan is pushing the hot air from one side of the room to the other.You look at the new kids, grades 9 and 10 who have shown up for the summer course, to make it into a better class next year, or because the school demands it of them. Now you know they won’t learn enough in 10 days to make a difference, and you know that it’s a money- spinner for the school .But you can’t do anything about it…. Some of the kids are really trying hard. I mean they don’t know that New York is a city and not a country but they really are prepared to make an effort. However, once they finish the course and are put in the weak group ,their frustrations will begin to come through. And then,when faced with the Bagrut (matric) paper which is really more of an intelligence test than an English test, they will look to cut corners.I have seen it now so many times,but it still frustrates me. I can’t help them .I can’t change the system. There are a lot of teachers out there trying to change it , but apparently there are too many “powers-that-be” who stand to make revenue from it and so the chances that we will ever be able to get the Bagrut cancelled are minimal. On the other hand, it was nice to go back to the classroom after my sabbatical and see that I don’t hate it.I was scared I would not be able to make it through the day, especially as the mercury climbed even higher by 3.45 ,the last period. Now I am back to earth,having delved into wikis, flat classrooms, cooperative classrooms and suchlike in my virtual life this year, I bumped down to the reality of no air condtioning, no laptops and no freedom to do what I would really like with these kids. The main problem seems to be overload. The more sites you find ,the more you get carried further inward. I constantly come across wonderful people doing incredibly creative things, saying really insightul things about the use of the Web in the classroom,or the trouble with the Web, or introducing me to fascinating new concepts in language learning. So I bookmark them and surf on. And on. And it’s endless. There is always another page, another site, another brilliant person waiting to be read. In fact today I found a splendid blog by a gentleman called Tom Hemingway, an American educator resident in Turkey .Now the thing is one needs time to read his blog and THEN to proceed to read all the wonderful references he gives to other people’s blogs. I mean it’s completely endless.And now I am on Sabbatical so I have time to pursue these things at leisure ,but what will I do when September rolls around? I also joined the Flat Classroom Project Ning and Wikispaces with the hope that I will incorporate these things into my teaching next year. But on the other hand, how do I know that I won’t sink back into the miasma of mundane book exercises and worksheets, taking the path of least resistance? Get the Wild Animal Snapshot widget and many other great free widgets at Widgetbox!